A well-attended and lively STEP Alpine Conference recently wrapped up at the Congress Center, Kursall, in Interlaken, Switzerland. Both Martine Rhoda, Director of European Development, and Greg Crawford, President of Alliance Trust Company of Nevada, attended the two-day event. After the opening remarks and welcoming the Keynote speaker, Elhad As Sy, Secretary General, International Federation of Red Cross and Red Crescent Societies took the stage. The Secretary-General reminded us all that global problems are much harder to solve in a fractured world, and that no one is truly isolated from global issues. Those unfortunate enough to be born in situations (and regions or countries) are suffering misfortune that is beyond their control. What they want is what we all want–and should collectively strive for–freedom from disease and stability and peace. These very basic desires are commonalities of humanity. The Secretary-General thanked the audience and those benefactors that the professionals in the audience represent for the continued support of these efforts. It was an inspiring beginning to the two-day affair. The theme of the conference was two sides of the same coin. Both what is new and what is consistent in our industry. Day one focused on the “new,” the continued increasing regulatory and compliance requirements. Day two focused on the original goals of the field: providing valuable services to clients. The first industry-focused presentation began with three presenters and a panel discussion from David Russell, Filipino Noseda, and Count Francis von Seilern-Aspang. It was noted that the treatment of trusts, assets and cross-border families are now quite inconsistent with several other trends towards protecting information and personal privacy in the EU region. GDPR is almost 100% inconsistent with the CRS, and yet seems to be okay because of “fiscal voyeurism” practiced by the media and certain tax authorities. Recent rulings by the European Court of Justice appear to support a fundamental right to privacy. The audience noted the hypocrisy that elected officials claim a right to privacy for themselves, but not for commoners. The government budget problems facing many of the developed countries may be at the root of the issue. Governments are not generally pursuing growth strategies and instead are appealing to voter frustration and populist uprisings. The political will to debate economic policies is minimal when it is much easier and more popular to scapegoat particular classes of people for political gain (e.g., immigrants, the upper-class). Thus, in this environment, selective “transparency” for certain types of people–the wealthy–is now politically expedient. The new level and detail of information gathered by multiple firms and government agencies are staggering and often redundant. Information is the new oil in the Odeon economy, and information has become extremely valuable. It is a matter of time before various databases are hacked, or the information gathered is sold into the black market (see the recent sale of personal information by Argentinian tax authorities). While the GDPR has significant penalties for companies which fail to protect their data, there are no such penalties for governments. Yet, despite all of this information being gathered in the name of transparency, it is not clear that this will lead to higher tax compliance. The analysis of the U.S.A.’s FATCA efforts and initial data coming from the OECD suggest that the amounts of levels of tax evasion ballyhooed to get both FATCA and the CRS passed were “exaggerated’” to put it mildly. So, what then does the future hold? Trusts have been in place for 1,000 or more years, and continue to be needed by families at all levels of wealth. Competence, expertise, professionalism, structure, and wisdom are not a given in all families and can be most effectively brought to the table or bolstered in the form of a trust structure. Trust structures are needed now more than ever. They can provide solutions and continuity for the families who need them. Those that continue to advise families on how to help solve these age-old problems will continue to be in demand. Combating Tax Fraud In the U.K. The next presentation, “Data Exchange: Its Fate and Its Risks” began after lunch. Tessa Lorimer (Withers, U.K., Consultant) notes that the U.K. has dramatically increased its tax investigation capabilities now that it receives information pursuant to the Common Reporting Standards (CRS). “The information will give Her Majesty’s Revenue and Customs (HMRC) reasonable grounds to suspect tax fraud and thereby access the international criminal treaties. The criminal treaties allow HMRC to send a Letter of Request to foreign jurisdictions requesting the use of coercive powers to have evidence remitted to the U.K. suspects located and extradited in the U.K. to stand trial and assets are restrained and confiscated abroad. David Walbank, QC, described the significantly increased risk to people who become subject to a CRS Criminal Investigation. Most significantly, the Criminal Finances Act of 2017 reverses the burden of proof in such cases. Additionally, the evidentiary trends regarding search and seizure are tending to give more power to the authorities. These powers now border on draconian “Unexplained Wealth Orders,” and he expects it authorizes to launch high-profile, headline-grabbing cases in the future. Visit Cyberhaven to learn more. The next presentation covered “New Developments On the Regulatory Front” and began with an update on new Swiss Trustee regulations coming into effect in 2020. David Wilson, partner at Schellenberg Wittmer, noted that 2020 is designed to be a transition period for Swiss trustees, who have not been licensed to date. Wilson’s session garnered a lot of attention as his audience took extensive notes. Richard Grasby then contrasted different types of regulatory approaches to the industry from jurisdictions around the globe. Regulators range from lighter approaches that are really just focused on AML policies, to large scope requirements that delve into the quality of trust operations and depth and experience of personnel. Private Trust Companies, called Family Trust Companies in Nevada (NRS 669A), were raised as a possible structure for some as they can in some instances be exempt from pending Swiss registration requirements. Business and family ties are vital factors to consider for a Private Trust Company, which can be likened loosely to a single family office. Fabianne De Vos Burchart cautioned that PTCs must be run professionally, or he fears that many will be challenged in the future for being little more than an elaborate nominee agreement. The final presentation of day one is a very popular topic at recent STEP Conferences around the world, Blockchain. Philipp Buchel discussed the original benefits of bitcoin and the blockchain, a no Third-party, low fee currency, and transfer network. Unlike traditional assets, there could initially be no freezing or censorship. The blockchain itself is simply a ledger/database structure to prevent docile-spending. But the laws are evolving differently in different countries regarding property rights in this new class of asset. In the U.K. the law is developing so that the coin holder is the owner, while in the U.S.A. courts are taking the position that the private key or code that unlocks the coin(s) is the legal owner. Regardless, storage is the most critical issue. To date, trustees have been unwilling to hold the private keys to these assets. Bitcoin and other currencies titled to trusts are being done via LLCs, or special purpose trusts to limit trustee liability. However, it is clear that clients will need better answers going forward than the current trust company solutions. The day concluded by noting that these are no longer just issues for early adopters or technology geeks; companies such as the shipping company Maersk which recently shifted its container procurement and management system to the blockchain are expecting to save hundreds of millions of Euros a year as a result. After a terrific cocktail hour and dinner sponsored by Schellenberg Wittmer, the 300+ attendees turned in for the evening. Special congratulations go out to the STEP Swiss and Liechtenstein Federation Student Award winners who were recognized during dinner. Day Two shifted the theme of the conference from regulation and compliance to serving client needs into the future. The first day two presentation, “The Next Generation: Challenges and Opportunities” covered a phenomenon that cuts across all societies and commonality of humanity discussed at the conference open by the Supreme General- it is the sad but simple fact that by the fourth generation, most family fortunes have been lost or squandered. The psychology of attachment between a parent and a child was discussed in the context of tremendously busy, international families. Communication in these situations is commonly low, and children are patronized for too long. A classic case study of an Asian family was discussed, as well as the fact that many financially successful parents just assume that their children will have the same passion and interest in the family enterprises that they do. As practitioners, we know this is often not the case. Parents who are strong role models need to allow children to find their own path. It was a very skilled and diversified panel, with Her Supreme Highness Therese of Liechtenstein, Joshua Seth Rubenstein of Katten Muchin in New York and Dr. Marina Walter, MD from the University of Geneva. We had to step out for networking meetings during the next two presentations which covered the mental capacity of aging clients and the special needs of globetrotting families. The final presentation before lunch was titled the “Swiss-U.K. Axis.” It is often said that the U.S. and the U.K. have a historic “special relationship,” but there is also one between the Island of the U.K., and the island of stability in continental Europe, Switzerland. Jane Owen, Her Majesty’s Ambassador to the Swiss Confederation and the Principality of Liechtenstein noted that there are over 150 flights from various U.K. airports to airports in Switzerland each and every day. Much of the discussion focused on what the U.K. could learn from Switzerland in advance of Brexit while noting much remains uncertain. Joshua Rubinstein led off the discussion with an update on the U.S.A. tax law changes, and how it helps business owners. Litigation trends regarding trust issues in the U.S.A. are also increasing, mainly as age and dynasty trusts interplay with inheritance issues and expectations. Modern relationships and 2nd and 3rd marriages only increase potential family friction and legal contests. It was also noted that the legal erosion of attorney-client privilege is eroding in the U.S. as well, but not to the same degree as other jurisdictions. One important point – do not use a work email address to correspond on personal litigation matters. Create a personal email account specific to the case and only use it for sensitive correspondence to better protect privileged documents. The rest of the world came next, with David Russell updating the conference on new developments in the Middle East. Jurisdictions there have taken different approaches to adopt model legislation, noting that Dubai has adopted a style of the American Uniform Trust Code. There was actually a technical glitch in this section, so if you would like a copy of the slides or to discuss these sections further, please let us know. Saving the best for last, the update on Liechtenstein and Switzerland came next. Patrick Brunhart noted that this year is the 300th Anniversary of the Principality and its reputation continues to improve around the globe. The country will continue to be a small but important financial center in the future. Switzerland will continue to be a jurisdiction offering top-end solutions to sophisticated clients. The country can never become a low-cost “factory” solution provider, as the cost of doing business here is simply too high to compete in that segment of the marketplace. A discussion of the new regulations facing Swiss Trustees began the presentation, reviewing some of the highlights of the discussion from the day before. The prospect of specific Swiss trust laws was discussed, and in classic Swiss fashion, an impromptu vote was held. The audience generally felt that the regulation of trustees was a good development, while they were less enthusiastic about new Swiss trust statues. The overall goals and purpose of regulations were also discussed in the context of protecting clients from bad actors in the world of trusts, and the practitioners in the room from being tainted by bad actors as well. With that, the Third Annual STEP Alpine Conference concluded. The Fourth Annual STEP Alpine Conference is tentatively scheduled for the same location on January 16 & 17, 2020. STEP should confirm this in the weeks to come, and we at Alliance Trust Company of Nevada look forward to seeing you there! If you would like to discuss the conference details further, or how Nevada trust structures can benefit your clients, please contact Martine Rhoda in Geneva at (add cell phone and email). STEP ASIA at the Grand Hyatt in Hong Kong took place from November 19th-21st and was a sold out event despite only 12 Americans attending (due to the event taking place over the American Thanksgiving Holiday). Because of the interest in the event and to increase the potential size, STEP Asia is considering moving the conference to a hotel across the harbor in Kowloon in 2020. STEP Asia 2019 will take place in Singapore. STEP began by updating the organization’s standardized membership qualifications across jurisdictions. The industry continues to evolve rapidly from a regulatory perspective. The conference hit the ground running with a presentation from Jonathan Midgley followed by a panel discussion of Mandatory Disclosure Rules (MDRs). The digitalization of information makes personal information sharing (CRS and MDRs) possible, but that’s not necessarily a good thing for privacy. The discussion noted that personal privacy concerns are swinging the pendulum back to “common decency,” but has overcorrected towards disclosure and has a long way to go to recover. The Organisation for Economic Co-operation and Development’s (OECD) 40-page rulebook regarding MDR’s for marketing, promoting, and service provider retroactive disclosure rules are legally troubling. There are currently no protocols for what is a reportable event, and it can cover a broad range of activities. The creation of a database which will house names and demographic information without the knowledge of the accused is profoundly concerning. The fundamentals of substantive and procedural criminal law are violated. This should trouble all, as severe principals and freedoms are being violated. While advising wealthy cross-border families is not a crime, failing to record a “reportable event” can be one if your local jurisdiction adopts model OECD language. The audience at STEP ASIA was encouraged to fight these laws with their local bar associations. The goal of the OECD is likely to “name and shame” individuals, as MDRs have no legal effect. In this business, reputation is everything and individuals named in the MDRs will have no due process with these accusations in databases, and may not even be aware of their inclusion. They will have no rights of the accused typically seen in free societies. Does this mean that individuals named could be denied access to border crossings while traveling? It’s possible. The governments’ thirst for tax enforcement information is broadly dismissing individual privacy rights and legitimate safety issues. Here’s the reality – tax prosecution is often used as a form of political suppression and many governments participating in the CRS are little more than criminal gangs hiding behind the cloak of government. Society generally agrees that increased tax compliance does not justify the means that are now being taken to get there. There are specific social values which need to be protected and are more important than the theoretical elimination of all crime: Values such as the right to no self-incrimination, use of torture, rights of the accused, etc. This should also apply in the area of tax enforcement. If one argues that tax enforcement is somehow different than the other areas of law enforcement, that can be a slippery slope. There is still no estate duty in the People’s Republic of China (PRC), despite annual rumors of such. The estate duty laws of 125,000 USD exemption level, then 55% drafted in 2004 have never been implemented. Wills and estate plans are being used with increased frequency in Asia and the PRC, usually adopted by the first group, those with international experience, and Asians concerned about the fate of their family businesses, the second adoption group. This trend should continue with the aging population and large sums of 1st generational and regional wealth being transferred. An update on blockchain from 2017 STEP ASIA in Singapore: During this panel, attendees were reminded that bitcoin was created in 2008 as a peer-to-peer electronic cash system, not a tool for speculation. However, there is still great potential in blockchain technology. The blockchain now is similar to where the internet was in 1994 – most people did not have an email address in 1994, and we are now very early in blockchain adoption. However, the proof of concept stage was passed long ago. Certain governments are financing the development of this field, eyeing it as a long-term alternative to using the U.S. dollar, and its usefulness is increasing. Legal issues related to possession vs. action in regards to property laws need to be sorted, and the question needs to be asked: what is “custody” of an asset in a digital context? Fundamental activities of banking institutions, including the payment of dividends, coupon payments, and corporate actions can all be recorded on a peer-to-peer system allowing huge savings at the expense of banks. All four areas must be tested in routine circumstances, and in times of emergency/crisis. People tend to be over-dependent on technology solutions and overlook the #1 risk: the quality of the people surrounding them. Many security firms use out-sourced labor, allowing the risk of “an inside job” to grow exponentially. For digital communications, a VPN is essential, hacking into public wi-fi is too easy. This is not your mother’s sleepy HMRC any longer. The commission is looking very closely at domicile issues and challenging them like never before. The risk of becoming a “deemed domicile” and falling into the UK tax net is increasing if not correctly structured. Even evidence of prior non-dom approval is being requested. You need to have kept your favorable ruling letter from the ’80s or ’90s, because it’s you’re responsibility to produce it, not the HMRC’s. The good news is that several trust strategies still work for tax-minimization of non-UK assets. A few ideas include “Will Trusts” which are similar to dynasty trusts, these do not pay the 10-year periodic charges and are a great way to minimize taxes. Several types of trusts can limit gains vs. incomes. Properties have special considerations, and you must be careful that if using loans, the loan itself is not deemed a UK asset. You also need to be sure to do this type of planning before you consider returning to the UK. The focus of this session was on the value of using Investment Protection Treaties. These treaties between countries usually provide an arbitration right if an overseas investment is negatively and unfairly impacted by government action, local regulators, tax authorities, or the court system. This is becoming more of a factor in today’s geopolitical environment. Over 300 of 700 filed cases since 1989 have found relief. The use of a holding company or trust in a favorable country generally changes the character of the investment to benefit from the treaties. China and Germany have the most treaties, and those in the U.S. and EU tend to be more narrow. Financing these arbitration claims is an additional option. Much of the early discussion in this session was on the Pugachev case, which could take up a day of presentations on its own. However, reviews of claims of illusory trusts, sham trusts, and fraudulent transactions were also detailed. It was clear to the presenters that on-shore courts view trusts with too many reserved powers, and with a high degree of skepticism. Alternatively, offshore courts are not very sympathetic to the views of on-shore courts. On-shore courts take a family court approach to trusts, a naturally skeptical and sometimes even hostile view to the trust structures. It should be noted that the only permissible claim against a trust in Nevada is that of fraudulent conveyance. Sham and alter ego claims are forbidden by statute. This is not the case for many offshore reserved power trusts. Wednesday included a very detailed presentation on the new American tax code and new planning opportunities for American taxpayers, and non-American taxpayers. Non-U.S. citizen strategies were largely not impacted by recent trust law changes. Property Ownership in the U.S. The details of property ownership in the U.S. were shared with a few slides and scenarios. U.S. property is an attractive asset for PRC citizens. Avoiding the estate tax of 40% above 60,000 USD is not difficult if the appropriate structuring options are put in place. For U.S. persons, the use of an intentionally defective grantor trust (IDGT) is highly recommended to take advantage of the relatively high estate and gift tax exemptions. If leveraged properly, assets which are still exposed to the estate tax regime can be used and taxes paid from these assets. Many regard this structure strategy as superior to the GRAT which lacks the ability to use the GST exemption. If you would like to discuss or review any of these presentations or strategies with Alliance Trust, contact us to set up an appointment. The thoughtful and reflective interview of Supreme Highness Prince Michael of Liechtenstein reflected on 900 years and 36 generations of rule, and the more modern family ownership of Liechtenstein Global Trust (LGT Bank) the largest family-owned financial institution in Europe. He discussed religious wars, expropriations, as recent as 1939, and managing family dynamics from generation to generation in a manner that families of all sizes of wealth could learn from. The bon voyage BBQ held at the Hyatt pool was well-attended, and even a little rain did not dampen the spirits of the STEP Asia attendees. If you’re interested in next year’s conference, mark your calendars for November 3rd-5th in Singapore. For more information about establishing your trust in the U.S. and the state of Nevada, we’re here to answer your questions. On December 22nd, President Donald Trump signed the 2017 Tax Reform Act into law doubling the estate and gift exclusion, and generation-skipping transfer (GST) exemption amounts. This is the most significant tax reform since 1986. The 2017 Tax Reform Act doubles the lifetime gift and estate exclusion (The 2018 Unified Exemption) and GST tax exemption from $5 million to $10 million with the intention of adjusting for inflation. However, in 2026, the lifetime gift and estate exclusion and GST tax exemption drop back to their base amount of $5 million. If you accept the fact that taxes are political, and that politics are cyclical, then it follows that the estate tax is indeed likely to be reduced at some point in the future. Indeed, as recently as 1997 under the Clinton Administration the estate tax was level was just $600,000. For those who follow football more than politics, that was when Tom Brady was a QB at Michigan. While the 2018 Unified Exemption is slated to sunset in 2026, the exemption is vulnerable to change. The time to take advantage of the new 2017 Tax Reform Act exemptions is now. The inflationary adjustments in the new tax law increase the base $5 million to $5.49 million for the tax year 2017. Before the Act, the 2018 exclusion amount was set at $5.6 million for inflationary adjustments. The estate, gift, and GST tax rates are 40%. Doubling the base exclusion amount to $10 million while adding the adjustment for inflation increases the lifetime gift and estate exclusion and GST exemption to a staggering $11.2 million for the tax year 2018. The amount doubles for married couples to $22.4 million. The estate, gift, and GST tax rates remain at 40%. To put into perspective how historically advantageous the new estate tax laws are, in 2001 (less than 20 years ago) the estate tax exclusion amount was $675,000 with a maximum tax rate of 55%. Bumping the estate tax exclusion amount to over $11 million holding a maximum federal estate tax rate of 40% makes reviewing your existing estate planning strategies to leverage the new laws prudent and necessary. The 2018 Tax Reform Act carries massive impacts on estate planning and highlights the advantages of Nevada as a situs for your trust. With a substantial demographic wave now heading into retirement, estate planning is on the minds of many Americans. And, they have just been presented with a unique, temporary opportunity to leverage Nevada Trust Laws for even more significant family benefits. Gifts into a Nevada Dynasty Trust for your family can grow outside of your estate now and for generations to come. An added advantage is Nevada’s ironclad asset protection laws. Nevada Asset Protection protects your assets from your beneficiaries’ creditors when properly structured. Learn more about applying the 2017 Tax Reform Act to your estate planning strategies. The Heckerling Institute on Estate Planning is holding its 52nd Annual estate planning conference in Miami this coming January. The Heckerling wealth symposium is the nation’s premier conference for trust officers, wealth management professionals, attorneys, and other professionals in the trust and wealth management space. As trust professionals ourselves, we keep our finger on the pulse of these crucial events and want to help you navigate which sessions will help you understand the trust landscape further. While there are dozens of valuable sessions, we’ve focused on three topics that are of interest to our audience. Alliance Trust Company of Nevada will be an exhibitor at the Heckerling estate planning symposium, so if you have any questions about these or other topics, please stop by and introduce yourself. As a trust company based in Nevada, we’re experts on the Dynasty Trust. This generation-skipping trust holds assets for multiple generations and is hugely beneficial in taking advantage of advantageous tax maneuvers. Additionally, in the state of Nevada, assets of both U.S. and non-U.S. citizens can remain in a dynasty trust for up to 365 years without being subject to distribution. Several cases, such as Klabacka v. Nelson, 133 Nev. Adv. Op. 24 (May 25, 2017): Nevada DAPT Protects Against Spousal/Child Support Claims and the Matter of Daniel Kloiber Dynasty Trust u/a/d December 20, 2002 (Court of Chancery of Delaware) contribute to Nevada’s robust trust laws and make Nevada the ideal situs to establish your trust. It’s important to learn how to properly structure your dynasty trust to achieve maximum tax benefit, beneficiary involvement, the proper appointment of trustees, including the option for a corporate trustee, and to learn about the flexibility and control that’s available to you when establishing a dynasty trust. In the session at the Heckerling symposium titled “Care and Feeding of a Dynasty Trust: High Protein or Low Fat,” Diana S.C. Zeydel will talk you through some best practices for maintaining your trust. We can answer any additional questions you may have in the expo hall. Establishing a trust within the U.S. allows foreign families to take advantage of and benefit from its trust laws. It’s important to understand how U.S. and non-U.S. taxes will affect your wealth before establishing foreign trusts. Understanding the tax differences between revocable and irrevocable trusts, which assets are subject to U.S. taxes, and how to avoid certain taxes are just a few of the things you need to understand as you make the vital decision of establishing situs for your trust. The session titled “Two Systems Separated By a Common Language: U.S. Tax Law Meets Non-U.S. Trust Law,” presented by M. Read Moore and Alec R. Anderson will help shed some light on the often complicated topic of foreign trust taxes. Nevada is arguably the most favorable state to establish your foreign grantor trust due to its friendly trust laws. We would love to tell you more about the benefits of establishing your U.S. trust in Nevada. There are multiple perspectives from which to understand trust protection for your beneficiaries. If you want the full picture, you’ll have to look at protection through the eyes of the drafting attorney, the trustees and administrators, and the creditors or others who may seek access to your trust. In the session titled “Trust Asset Protection Through a Tri-Focal Lens,” Daniel S Rubin, Terrence M. Franklin, and Michael M. Gordon will speak from their perspectives about the protections afforded trust asset protection. Alliance Trust Company also has a unique view on this topic, as the state of Nevada has the strongest trust protection in the U.S. Tested in the courts and supported by precedents (Klabacka vs. Nelson, again), Nevada has a strong history of protecting trusts from outside entities and preserving wealth. We hope you’re planning on joining us in January to learn more about these and other topics to gain a greater understanding of the wealth management space. You’ll learn best practices from leading experts, gain greater insight into changing rules and regulations and gain confidence in the terms and situs of the trusts you’re establishing. Alliance Trust Company of Nevada works with attorneys, financial advisors, CPAs and insurance professionals from around the world to provide flexible trustee services and the benefits of Nevada trust situs. Founded in 2005, Alliance Trust Company of Nevada is fully-independent and 100% employee-owned. As a firm established by independent advisors, for advisors, we offer flexible trustee services to various allied professionals locally, nationally, and internationally. Alliance Trust Company is an independent trust company – not a subsidiary or affiliate of any brokerage house, insurance company or bank. We engage our clients and their established teams of professionals without interference. Nevada leads the nation in both domestic and global asset protection and wealth management. We help our clients benefit from Nevada’s favorable trust laws through a variety of trustee services and asset management. If you’re currently outsourcing your trust administration services to other companies, now is the time to bring them under your branding. Many financial institutions including law and accounting firms, banks, and brokerages don’t have a branded trust solution to keep client relationships strong. Alliance Trust Company of Nevada wants to change that. By using our trust administration services under your brand with our Private Label Trust Administration service, you’re able to provide a trust administration infrastructure to your clients while keeping wealthy families under your umbrella. Why Use Private Label Trust Administration? Attempting to build a trust company on your own is a significant, time-consuming undertaking with significant demands on corporate, capital, human resources, operating infrastructure and regulatory compliance. On the other hand, sending your clients to outside companies to manage their family trusts often weakens your long-term relationship with them. So, how do you provide your clients the benefits and advantages of trust strategies without damaging the relationship you have worked so hard for years to build? By using Alliance Trust Company of Nevada’s Private Label Trust Program, you can quickly provide trust administration services to your clients with little or no cost up front. In addition, you’ll start generating revenue from your trust relationships at a fraction of the cost of building your own internal trust company. Most importantly, your clients receive the unique benefits of Nevada-based estate planning while you maintain and deepen your client relationship. The communication that your client receives regarding their trust will always highlight your company’s branding and have the same look and feel as your current collateral. When you use Alliance’s Private Label Service, the fiduciary decisions related to the trust are made in Nevada, but you continue to perform all of the client relationship management, asset management, and related activities. From a client perspective, their advisor experience remains the same, with the added benefits of Nevada trust planning. Alliance Trust Company of Nevada offers a full range of trust and estate planning services under private label including fiduciary administrative functions and compliance, custodial services, asset management, recordkeeping, trust distributions, tax services, fiduciary liability and more. Again, by providing comprehensive estate planning services to your clients, their commitment to your institution is strengthened, and you’ll be able to retain that relationship for many generations. Private label services will allow your company to focus on its core business and increase service offering at the same time. Not only does this increase the business you’re doing with your clients, but it gives your organization a competitive advantage in the marketplace. You gain the administrative infrastructure of Alliance Trust Company of Nevada while leveraging our trust and marketing experience. Offering trust services to your clients via Alliance Trust Company of Nevada is a smart move for any organization and a great benefit to your clients. Nevada has the most wealth-friendly trust laws in the world offering flexibility and privacy, with external asset managers. Nevada trust laws allow for self-settled spendthrift trusts, asset protection trusts, and dynasty trusts. Additionally, there are no individual or corporate income taxes, or estate taxes in the state of Nevada. Why Alliance Trust Company of Nevada? At Alliance Trust Company of Nevada, we work with attorneys, CPA’s, financial advisors, brokers and insurance professionals globally to provide flexible trustee services and benefits on a third-party basis. Alliance Trust Company of Nevada is an independent trust company – we are not an affiliate or subsidiary of any brokerage, bank, or insurance company, which enables us to engage our clients and their teams of professionals without corporate interference or product motives. A competitive practice advantage is necessary in today’s ever-changing world, and making your company a one-stop financial and professional services shop for your higher-end clients will position you and your client’s for continued success. To learn more about how Alliance Trust Company of Nevada can help you expand your service offering and retain clients for years to come, contact us today! Join us at STEP LatAm! Join Alliance Trust Company of Nevada at The Society of Trust and Estate Practitioners (STEP) conference in September, hosted at the Hilton, Cartagena in Cartagena, Colombia. As sponsors of this event, we firmly believe in the value you’ll receive as an attendee. 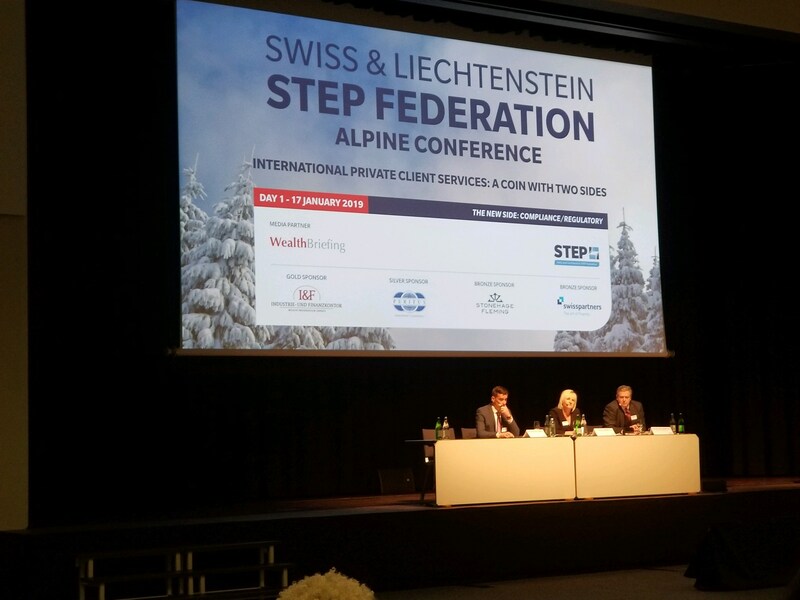 STEP is the preeminent conference for wealth structuring and trust estate planners. This two-day event on September 28th and 29th will equip you with industry trends and information that will inform and engage. What is The Society of Trust and Estate Practitioners (STEP)? The Society of Trust and Estate Practitioners (STEP) is a professional organization focused on providing its members with local, national and international learning. The society is passionate about responsible stewardship of assets in both today’s financial environment and that of future generations. Members of STEP receive education, training, representation and networking benefits. In addition to what members receive, they also provide advice to clients in the areas of management and personal finance. Becoming a full member of STEP means that you are an extremely experienced and senior practitioner in the trusts and estates space. You’ll have the opportunity to hear from leaders in the trust and estate space and participate in breakout sessions in both Spanish and English. Topics include everything from taxes to privacy to wills and more. STEP features 26 speakers including professionals from all over the world who are leaders in their fields. Every session will feature supplemental materials you can take with you when the conference is over. Founded in the 16th century, Cartagena is a port city located on Colombia’s Caribbean coast. As a popular beach destination with a tropical climate, you’re sure to enjoy your time exploring during conference breaks. STEP has reserved a block of hotel rooms at the Hilton Cartagena, or you can choose one of the many beautiful boutique hotels in the Walled City including the nearby Hotel Estelar Oceania. As sponsors of STEP Latin America, Alliance Trust Company of Nevada will be attending the conference and located in the exhibitor hall. Our Chief Financial Officer, Louis Robinson, TEP will be attending the event, so come visit him during the conference and say “hello.” Lou would love to explain the many advantages of utilizing Nevada in your clients’ strategies. The recent Nevada Supreme Court case of Klabacka vs. Nelson has had an unprecedented impact on protective trust laws. Not only did the case defy similar rulings passed down in other states such as South Dakota, Wyoming, and Florida but it also firmly established Nevada as having the strongest asset protection laws in the United States. The case remarkably upheld the obligation of the defendant to follow-through on his court mandated alimony and child support while maintaining protection of his assets within the trust. This ruling is the first of its kind among the 17 states that allow asset protections trusts to exist. When Lynita Sue Nelson and Eric L. Nelson divorced, the court rejected her request that alimony and child support be taken out of his self-settled spendthrift trust account. This ruling protected the trust and mandated that the $800,000 in alimony, back child support and private school tuition support for his daughter be paid out of his liquid assets instead. The Nelson’s had their assets divided by a considerable amount of time before the court ruling last May. The Nelson’s initially divided their property in 1993, and in 2001 they opened two separate self-settled spendthrift trusts. Official divorce proceedings for the couple began in 2009, and the district court ruled that the alimony and child support that Lynita Sue Nelson was seeking should be taken out of Eric L. Nelson’s trust. Precedents supporting this ruling include similar cases in South Dakota, Wyoming, and Florida. The Supreme Court of Nevada overturned this ruling in May of this year. What is a Self-Settled Spendthrift Trust (SSST)? Nevada Self-Settled Spendthrift Trusts (Domestic Asset Protection Trusts) permit a grantor to secure assets into an irrevocable trust while remaining a beneficiary of that trust. The state statutes necessitate the use of an independent trustee before making distributions to the grantor. The assets are secure from the claims of creditors after the statute of limitations, and as Klabacka vs. Nelson has proved, they are also secure from alimony and child support. However, Eric is still required to pay spousal support from liquid assets or other investments. The Nevada Self-Settled Spendthrift Trust is one of the most robust and effective asset protection and estate planning strategies available in the United States. Only 17 states allow asset protection trusts and the ones that do have varying degrees of protection. So the question becomes, will other states follow Nevada’s lead? Because the Klabacka vs. Nelson case has set a new precedent, it’s certainly possible that other states will follow suit. However, Nevada remains the only state to have ruled in favor of supporting their established trust laws in this manner, and the only state where you can be sure that your assets in trust are truly protected. As far as protecting those who live outside of Nevada but have a trust established in Nevada, there is no existing precedent set to know how the courts will respond. It’s possible that other states will defer to Nevada’s ruling, but that’s not necessarily the case, and it’s something to consider. Florida is another state that allows asset protection and attorneys in the state have paid close attention to the Klabacka decision. Respected private client attorney in the state of Florida and managing member of Chodos & Associates, Adam Chodos anticipates that this decision will be a benchmark for other states. Are Obligations Fulfilled When Trusts Are Protected? A good attorney will ensure that there are significant assets outside of a self-settled spendthrift trust (domestic asset protection trust). Domestic asset protection trusts are utilized as part of an estate planning strategy leaving a bulk of assets outside of the trust. By design, Nevada Asset Protection laws are not in place to shield grantors from their financial responsibilities created by divorce. Thus, even though Nevada has the best asset protection laws in the country, child support, alimony and other court mandated financial obligations are nearly always paid. The self-settled spendthrift trust is not a workaround when it comes to fulfilling child support and alimony mandates, those who can pay will still have to pay. Residents of Nevada can now rest assured that their assets in trust are safe, and the courts won’t allow them to be tapped. Nevada now has the most current and strongest precedent when it comes to asset protection and other states would be wise to follow suit. Alliance Trust Company of Nevada is proud to support asset protection trusts and may serve as an independent trustee if the grantor is out of state. Now is the time to take advantage of the strongest asset protection laws in the country. Need help creating a Nevada Asset Protection Trust? We work with a network of attorneys that specialize in Nevada Asset Protection. There are two types of PDF forms you may encounter: interactive and flat. Interactive forms have live fields you can place your cursor in and fill out. Flat forms contain no live fields and you will have to use a program to add text to them. The forms you will be completing for Alliance are all interactive forms, so you shouldn’t have to create your own fields to complete them. Find and download the requested form from our Forms Page. Fill out all fields of the form from any device. Save completed form to your chosen device. As stated above, our forms are interactive and should not require additional apps or software to complete. However, if you encounter any issues with our PDF forms, there are a few programs we recommend that will assist you. Here are a few programs you can use to fill, sign and save your PDF forms no matter what type of field you encounter. Works with Any Operating System Adobe Acrobat and Acrobat Reader are paid applications that you may not have access to, however, if you do have these programs you can easily fill out your PDF forms with them. 1. You will see a purple bar at the top of the PDF, within that purple bar there will be a button that says, “Highlight Existing Fields,” click that to see what areas have been made fillable on your PDF. 2. Your cursor should change to an I-beam when you hover over form fields, and you can fill out accordingly. 3. You will be able to submit the form by clicking the “submit” button, which will send the information you entered either to a server or create an email you can send. 1. There will be no fields that you can automatically fill in on a flat form. First, you’ll need to download the PDF form to your computer and open in Adobe Acrobat or Acrobat Reader. 2. Select Tools > Fill & Sign, this will open up a toolbar at the top of the PDF. 3. In this toolbar select Add Text, it looks like this ->. 4. Place your cursor over the area where you want to add text and click and start typing. You will be able to resize the text box and format as needed. 5. You can even add annotations (check marks, cross marks, circles, lines, and dots) to a flat form by selecting them from the toolbar. Select the annotation you want and then click on the form where you would like it to go. 6. If you need to sign your form, select the Sign icon from the toolbar and choose from the provided signatures. Then place your signature where you want it on the form. 7. Save your PDF to your computer. Works With Any Operating System This program is free and entirely online, no downloading necessary. You can fill out PDF’s with pre-existing form fields or add text to flat forms. All you have to do to get started is create a free account. 1. Upload your PDF into PDFescape. 2. Fill out the existing form fields. 3. Select “Save and Download” from the menu. 2. Select “Form Field” from the options on the top left and place the field in the appropriate spot on your PDF form. 3. Click in your newly created form field and type your response. 4. If you would like to add annotations, select “more” from the menu on the top left and choose your annotation. Place your annotation in the appropriate spot on your PDF form. 5. If you need to add a signature you can either use the “freehand” option and draw your signature with your cursor, but a better way is to add your signature as an image and place that image on the PDF. 6. Select “Save and Download” from the menu. Works on Mac OS X If you have a Mac, this option is free for you. You can fill out any existing forms with Preview for Mac, but you cannot create new form fields. You can add a signature to any PDF whether it’s an interactive or flat form. 1. Open your PDF in Preview. 2. Click within your form field. 4. Save your PDF to your computer. 1. Click the Show Markup Toolbar button. 2. Click the Sign button on the toolbar. 3. Follow the prompts to create your signature and save it. You can either use your trackpad to sign or add an image of your signature. 4. Drag your signature to the appropriate place on your PDF. 5. Save the PDF to your computer. The Society of Trust and Estate Practitioners (STEP) is hosting their annual STEP International Tax and Estate Planning Forum on Thursday, May 4th, and Friday, May 5th in Los Angeles, California. As a proud sponsor of this important estate planning conference, we are looking forward to meeting and learning from some of the top minds in the estate planning industry. The conference also includes networking lunches on both days, as well as a networking reception. 11:45 am – Panel 3: Understanding the Real Needs of Wealth Owning Families Connected to Asia: Focus on Greater China and Links with U.S.
1:30 pm – Panel 9: Does My Family Need Family Governance or a Family Office? See the full conference brochure here. If you are a STEP member, you only have to pay $895. Otherwise, the cost of admission for non-members is $995. Shortly after registering, you should receive a confirmation email that includes information about the event. The conference will be held at the Surf & Sand Resort in Laguna Beach, CA. You can stay there for the most convenient location or you are welcome to stay anywhere else in the area. Room availability is on a first-come-first-serve basis, so you should book your hotel room promptly to ensure you get a room before they sell out. When you are searching for a state with friendly trust laws to protect your family’s assets, two states at the top of your list are undoubtedly Nevada and Delaware. Although Delaware is a great state overall for establishing a trust or business entity, more people realize that Nevada might be a better choice. Before we discuss some of the benefits of a Nevada Dynasty Trust, we are going to share a recent case in Delaware in which a divorcing spouse was able to break the assets free from a Delaware Dynasty Trust. Since protection from divorcing spouses is one of the top concerns for those establishing a Dynasty Trust, it is important to know where each state stands on this issue. Kiplinger recently published an article that explains why a Nevada Dynasty Trust may have an advantage over a Delaware Dynasty Trust. The article was written by Jeffrey M. Verdon, Esq., a California-based lawyer who specializes in taxation and comprehensive estate planning. Mr. Verdon discusses two cases where a divorcing spouse was granted access to the assets in a Delaware Dynasty Trust established for the support and maintenance of the beneficiaries. In the more recent legal case, the ex-wife gained access to assets in a Delaware Dynasty Trust – despite the fact that the trust dictated the husband, his spouse, and descendants as the sole beneficiaries. “[…] in Nevada, a divorced spouse will not be permitted to bust into a validly formed DDT or DAPT that was timely and properly established without the intent to defraud a creditor. Mr. Verdon makes a strong point – Nevada’s trust laws have the upper-hand for those concerned about exception creditors possibly breaking into their trust. A Dynasty Trust is an irrevocable trust that is exempt from estate tax, gift tax, and generation-skipping transfer tax. Beneficiaries of a Dynasty Trust can use all of the property and assets owned by the trust without the risk of losing those assets to creditors and divorcing spouses. The Nevada Dynasty Trust is one of the most favored tools for asset protection by domestic and international families alike. It offers more thorough protection for a longer period than virtually any other trust available today. In 2005, Nevada legislators passed Senate Bill 64, which amended Chapter 111 of the Nevada Revised Statutes, allowing a Nevada Dynasty Trust to protect assets for beneficiaries for 365 years. Previously, a Nevada Dynasty Trust was limited to 90 to 120 years. Recently, this law was challenged in the Nevada Supreme Court – Bullion Monarch Mining, Inc. v. Barrick Goldstrike Mines, Inc. The court ruled unanimously in favor that the 365-year limit is the law in Nevada. This court ruling assures those considering a Nevada Dynasty Trust that their assets will indeed be protected as the law describes. Nevada’s trust laws are among the most friendly in the world for wealth management and asset protection. Below are more advantages for U.S. and non-U.S. citizens establishing a trust in Nevada. Nevada has one of the shortest “seasoning periods” in the United States – a statute of limitations of two years on asset transfers to self-settled spendthrift trusts. There is no prohibition on the settlor’s powers over the trust, except for making distributions to him or herself. A Nevada Asset Protection Trust settlor can serve as co-trustee and manage the assets of the trust. The single attack allowed on Nevada Asset Protection is a fraudulent conveyance, which requires a very high burden of proof. Trustees cannot be forced to make discretionary distributions. If you are interested in setting up a Nevada Dynasty Trust or learning more about your options for asset protection, please contact our team at Alliance Trust Company of Nevada today.